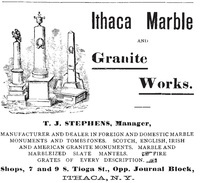 Gravestone inscriptions at Pleasant Grove Cemetery are rich sources of information about the lives of Tompkins County residents. The images carved on stone also reveal details about people and changing views about death. Village Preservationist Randi Kepecs reviews the meanings of these symbols in "Grave Symbols at Pleasant Grove Cemetery." The Association of Gravestone Studies' pamphlet, "Some Common Symbols/Emblems Found in 19th-Century Cemeteries," is also a handy reference to help "read" the gravestones at Pleasant Grove Cemetery.